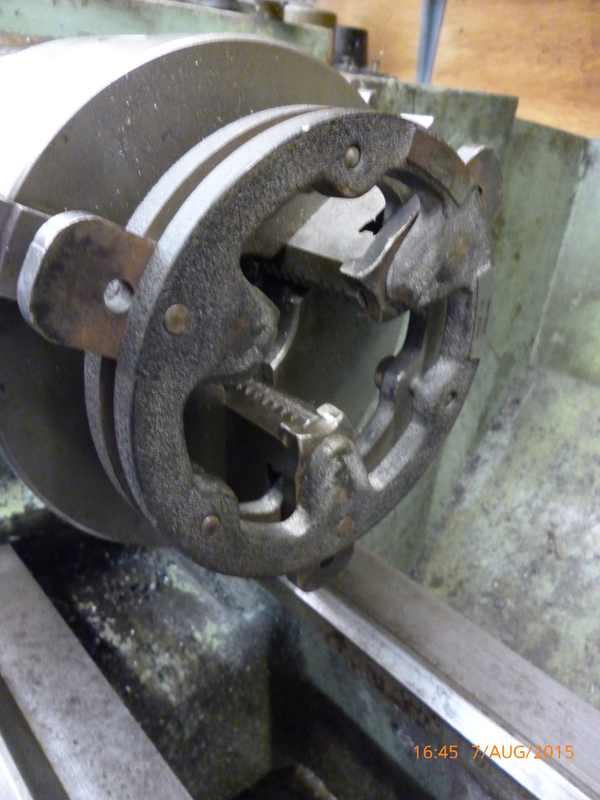 For any three jaw chuck there are several problems that can affect the way it holds the workpiece. The most common is that the axis of the workpiece is not coaxial with the axis of the spindle. This can easily be seen by putting a piece of ground, round stock in the chuck and measuring the runout with a DTI. It is usual for this to be several hundredths on a millimeter. There are ways round this covered elsewhere. But there are times when it might be worth being able to improve on this. A large part of this fault is often probably due to wear in the spiral that the jaws are locked into in side the chuck. It is also possible for the t-slots the jaws run in are worn. It is also possible for the chuck to be “bell-mouthed”. This means that the jaws have been bent slightly outwards. This can be caused by over tightening the chuck particularly if the workpiece is only held near the outer limit of the jaws. The usual solution to this is to grind the surface of the jaws that touch the workpiece. This is done with what is commonly called a toolpost grinder. More on this later. 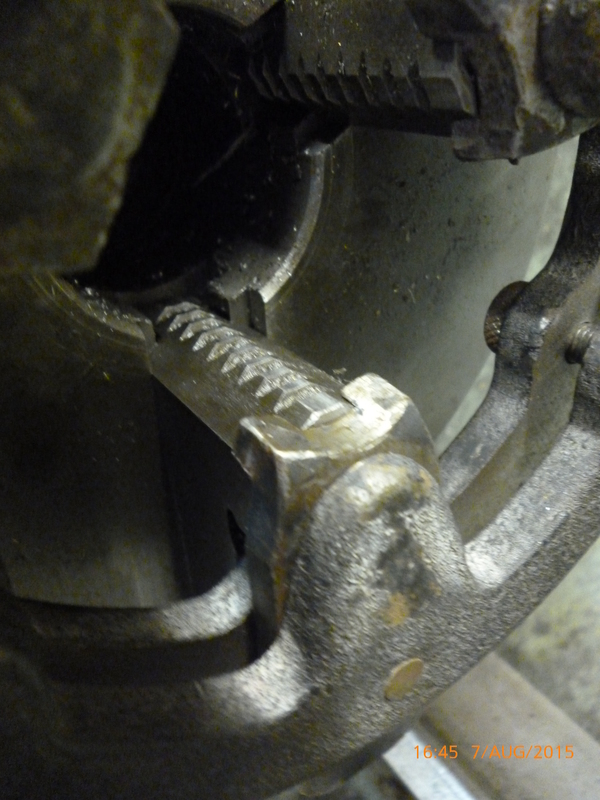 It will be noticed that this type of problem is only ever mentioned in terms of the inside surfaces of the chuck. In all cases, in order to grind the jaws, the jaws have to be ground when the are forced by the chuck key into the workpiece. In the case of runout the jaws also have to be ground at the radius required. For any other radius there might be a different amount of error. The problem of holding the jaws in the right position when the workpiece is not present also occurs when using soft jaws. In that case it is more complicated because the workpiece might be held with internal or external jaws. Grinding the internal surfaces of the jaws. The distance from the grinding wheel to the nose of the grinder must be long enough to reach right to the inside edge of the jaws. It is no use hoping a long thin, shank will do. The diameter needs to be perhaps, about one third of its length. The grinding wheel will need to be trued up with a diamond when the grinder has been set up, ie, after the grinding wheel has been fitted to it. This jig takes advantage of the shape of the jaw to be able to hold it with out covering any of the part of the jaws that have to be ground. Truing the grinding wheel will produce a large amount of very abrasive dust. It is essential that every part of the lathe is covered to protect it. After the jaws have been ground there will be dust inside the chuck. The only way of cleaning the chuck thoroughly if by taking it apart, cleaning with a brush and parafin, letting the parts dry and painting with light oil to protect it from rust. The ground surface will be parallel to the bed of the lathe. If the headstock is not setup properly so it is not parallel to the bed then the surfaces will be tapered and useless.